The host’s Facebook post has a poster on the event but there are no other details about pricing. Please contact the host about Pricing and other details at 702-792-8233. Jerry Rice is a former NFL wide receiver who played for the San Francisco 49ers for most of his 20 year career. Rice is considered to be one of the greatest football players of all time with 1,549 career receptions, 22,895 career receiving yards, 197 career receiving touchdowns and 23,546 career all-purpose yards. Rice played for the San Francisco 49ers from 1985–2000, the Oakland Raiders from 2001–2004, the Seattle Seahawks in 2004 and the Denver Broncos in 2005. Rice is a three-time Super Bowl champion for Super Bowls XXIII, XXIV and XXIX plus he was named Super Bowl XXIII MVP. 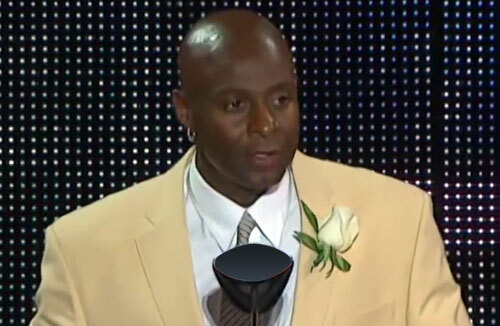 Jerry Rice was inducted into the College Football Hall of Fame in 2006 plus he was inducted into the Pro Football Hall of Fame in 2010. Sports Speakers 360 is a booking agent for pro athletes. If you would like to book Jerry Rice for a speaking engagement, appearance or endorsement, contact a Jerry Rice booking agent for fees at 1.855.303.5450.